Breaker bars are lengthy, non-ratcheting bars that are used together with socket wrench style sockets (Source). Breaker bars are great loosening extremely tight fasteners. 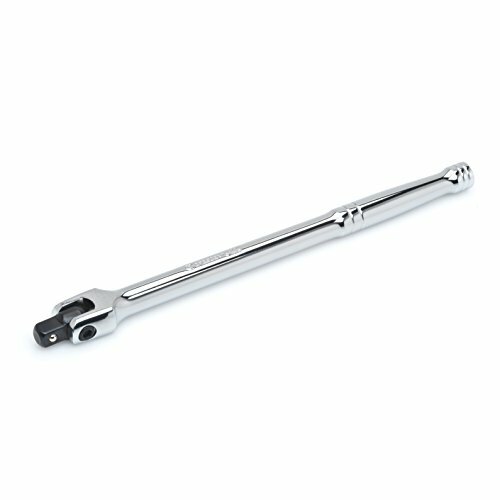 Their length (compared to extendable ratchets) enables you to apply significantly more torque than standard socket wrenches (Source). Tekton produces the longest breaker bar at 38" while Capri Tools produces the shortest breaker bar option at 12". Tekton and Neiko produce the best-rated options- users we interviewed recommended them above and beyond the other breaker bars we examined. As a small aside, in our research we discovered that many buyers were confused about the difference between a breaker bar and a torque wrench (Source). 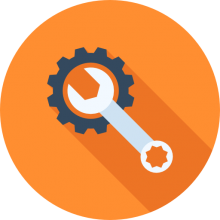 In a nutshell, a breaker bar is a brute-force tool that uses leverage to get a bolt off, while a torque wrench measures torque with a dial when tightening a bolt or nut (Source). The Neiko Breaker Bar 4.7 $ 24"
The Capri Tools Breaker Bar 3.8 $ 12"
The Tekton Breaker Bar 4.7 $$ 11" to 38"
The Crescent Breaker Bar 4.1 $ 10" to 19"
The Craftsman Breaker Bar 4.5 $$ 18"
This premium breaker bar offered by Neiko is well-made, flexible, and an excellent choice for breaking and loosening rusted nuts and bolts. Users love the design and the leverage, but some do note that it’s manufactured in China. 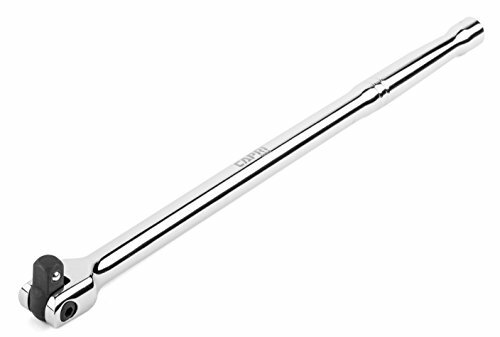 The Neiko breaker bar measures 2” x 12” x 2”, and it features an extra long 24-inch handle made of vanadium steel for maximum torque, a contoured grip, a 180-degree flexible head, a mirror-chrome rust-resistant finish, and a weight of 3.1 pounds. It also has spring-load ball bearings, and the bar meets or exceeds ANSI standards. A buyer shares that he bought two of the Neiko breaker bars and that they are very handy, convenient, and useful. He adds that the bar doesn’t have issues with rusted bolts and that he doesn’t have to apply too much force to get the job done. Another user mentions that he was surprised how well-built the bar turned out to be and that the handle is comfortable and easy to grip. A buyer also states that the bar arrived quickly and that it’s a pleasure to use it. He says that the swivel head is handy for hard to reach places. However, some customers have complained that the breaker bar broke very quickly and that it’s not suitable if you’re trying to loosen a tough bolt. Some users also note that they had problems with the swivel head. 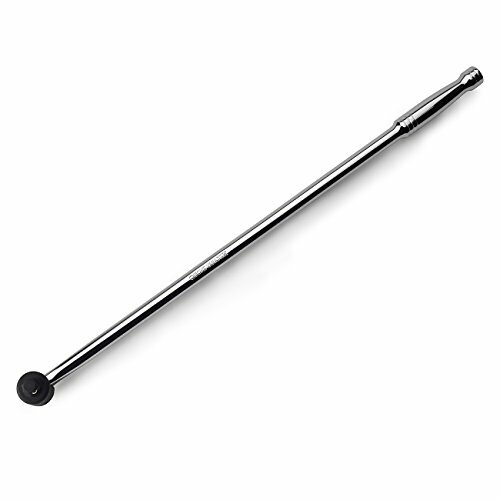 If you are in need of a cheap breaker bar, you may consider this 3/8-inch extension breaker bar offered by Capri Tools. Users love the length and the price of the tool, but some do note that it’s manufactured in Taiwan. The Capri drive extension bar measures 12” x 1” x 0.5”, and it features a weight of 12.8 ounces, a 3/8 inch drive, a capacity of 159 ft-lb, chrome –vanadium body, a chrome-moly head for added strength that rotates up to 180 degrees, and a spring-loaded ball bearing. The breaker bar meets DIN standers, and it has a lifetime limited warranty. A reviewer comments that the drive extension bar is invaluable when it comes to getting under the car and that it loosens rusted lug nut without bending. He highly recommends it as the best extension breaker bar available. Another buyer states that the bar is a necessity for every toolbox and that the length of the handle makes it perfect for car use. A purchaser also adds that the bar can handle a great amount of torque and that the quality is exceptional. However, some customers have complained that the breaker bar broke on the first bolt and that it’s easy to deform the socket connection. Some also note that they don’t recommend it for heavy-duty mechanic work. This extension breaker bar offered by Tekton is practical, convenient and well-balanced. Users love the durable steel construction, but some do note that they had problems with the head. 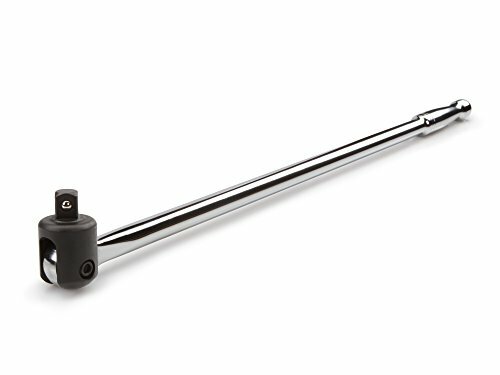 The Tekton drive breaker bar measures 24” x 1.3” x 1.3”, and it features a 180-degree flexible chrome-moly head, a spring-loaded ball bearing mechanism, a forged and hardened chrome vanadium construction, and a weight of 3 pounds. The bar also has a round-profile handle that provides a smooth gripping surface and a chrome-plated finish so that you don’t have to worry about corrosion and rust. The Tekton bar meets or exceeds ANSI standards. A customer comments that the drive extension bar is well-made and that he doesn’t have any issues removing old and rusted bolts. He adds that it’s ideal for removing nuts on axes and wheel bearings and that he highly recommends it. Another user mentions that the performance and usefulness of the bar were beyond his expectations and that it saved him money and time. A buyer states that you can achieve excellent torque with the breaker bar and that the chrome finish is of high quality. However, some customers have complained that the head has too much play and that the bar bent quickly. A user also says that the bar broke while using it on 36-mm axle nuts. This 18-inch breaker bar offered by Crescent is well-balanced, handy, efficient, and an excellent choice for tough nuts and bolts. Users love the price and the size of the tool, but some do note that it’s made in Taiwan. The Crescent drive breaker bar measures 19” x 2” x 1.5”, and it features a weight of 1.9 pounds, a chrome vanadium steel construction for improved performance and durability, and a chrome-plated finish for protection. The 18-inch drive flex handle meets or exceeds ANSI and ASME standards, and it has a full satisfaction guarantee. In general, users have a favorable opinion of the Crescent breaker bar, and they praise the elegant design and its performance. A buyer comments that he used it for lug nuts on an old Ford and the bar did its job without breaking or bending. He highly recommends it as the most reliable breaker bar available. Another reviewer mentions that the bar feels good in his hands and that Crescent makes excellent and long-lasting tools. He adds that the handle pivots easily and that he is impressed with the quality of the tool. A customer mentions that the breaker bar works exceptionally well and that he recommends it as the best extension bar available. If you are looking for a top-notched long breaker bar, you might consider this 18-inch drive extension bar offered by Craftsman. Users love the lengths of the bar, but some do note that there is no indication that it’s made in the USA. The Craftsman breaker bar measures 21” x 7.2” x 5.2”, and it features positive spots at 0 and 45 degrees, a hinged joint, a ¾ inch drive, and a weight of 2.8 pounds. This drive breaker bar comes with a lifetime warranty, and it’s made of high-quality material that guarantees durability. 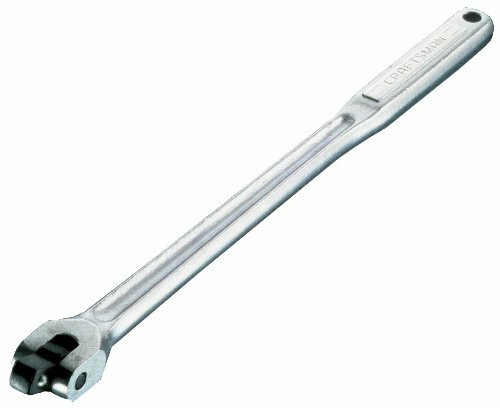 As a whole, customers are impressed with the performance of the Craftsman ¾ inch breaker bar, and they don’t have any major complaints regarding its functionality. A buyer comments that he is extremely satisfied with the breaker bar and that he doesn’t have any issues removing stuck nuts and bolts. He highly recommends it to anyone in need of a premium breaker bar. Another reviewer mentions that the bar arrived for two days and that it was in excellent condition. He states that the length is perfect and that it works far better than he expected. A user also says that the bar is handy to have around the house and that it’s very well-made. However, one customer complains that the bar has limited use and that it’s overpriced. The first breaker bar we examined was manufactured by Neiko- it is a 24-inch long option built from chrome vanadium steel. The advertisers describe it as employing a flexible head that adjusts 180°, ideal for accessing hard to reach tight spots and creating strong enough leverage to get the job done. It's designed specifically for loosening and breaking stubborn or rusted bolts and nuts. A heavy-duty breaker bar, buyers have described using it on motorcycle wheels, complimenting the leverage power it provides. You will have to be careful to purchase socket bits that will fit it- particularly because it is a 1/4 inch drive, as opposed to a 3/8 inch drive breaker bar. Other buyers describe having broken socket wrenches working on their cars, having put all of their weight and force on them, just to destroy them, before purchasing this rugged option that was able to quickly loosen incredibly stubborn lug nuts. Another reviewer describes buying this option to swap out the control arms on his vehicle- he says that because the shaft is so long, it produces a tremendous amount of forceful leverage that can break loose the most stubborn threaded bolts without too much force. This reviewer also advises people who are trying to remove a frozen bolt to spray the threading with WD-40 or a penetrating catalyst that will soak into the threads and make breaking or loosening the frozen bolt much easier. As well, it enables you to access tight and traditionally inaccessible areas like wheel wells- with some buyers purchasing shorter-length breaker bars than this 24-inch option to get into even tighter areas. The second option we examined is the Capri Tools 3/8 inch breaker bar- it is 12 inches long and has a 159 foot-pound capacity. The body is built from chrome-vanadium with a chrome-molly head that rotates 180°. Because of this adjustability, it is especially dynamic on a range of different types of jobs- meeting and exceeding the IN3122 standard. Reviewers have provided some mixed feedback for this particular breaker bar, with one reviewer saying that he tried to use it to remove lugnuts and it broke within a minute of him putting force on it. Another reviewer says that it is best to use only occasionally, especially for low-impact jobs like oil changes and transmission oil draining. Because it is a shorter length than other options, it's better in tighter spaces but doesn't provide as much force. The third option we examined is the Tekton breaker bar- it comes in different lengths: 11 inches, 15 inches, 24 inches and 38 inches and either 1/2 inch or 3/4 inch versions. Tekton advertises it as an alternative means of using your ratchets stuck bolts or frozen nuts- enabling you to bust them loose without employing too much force. Buyers say that if you need to adjust the tightness of the swivel joint, you can do so with a screw- it's a 5 mm hex head. Another reviewer says it is a heavy-duty option that generates abundant leverage, potentially useful for changing axle nuts. One buyer who purchased the 40-inch breaker bar says that it produces an amazing amount of power- working on axles, wheel bearings and hubs. Indeed, this is a professional-strength option that many DIY types find excessive for their purpose, although they love using it when they get the opportunity to. Another reviewer was amazed at how easily he was able to remove bolts and then tighten them back, like a hot knife through butter. A mechanic advises that you shouldn't use a breaker bar for tightening tire lug nuts because you won't be able to assess the actual amount of force the lug nut is torqued at. Many reviewers expressed surprise when they received their tool, saying that it was much larger and stronger than they had anticipated. One technician immediately used it to remove a seized nut from a hog blade- and was instantly able to jar it loose- telling us that it was a better option than breaker bars he looked at on websites from Grainger, Harbor Freight, and Tractor Supply. The fourth option below that is the Crescent Drive flex handled breaker bar- it has a chrome vanadium steel body that is nickel chrome plated for durable and extended use. The last option we examined is the craftsman 18-inch long breaker bar. Some buyers were a bit miffed, saying that they expected to receive a USA-made product, but the instruction manual and packaging do not indicate that it is made in the USA. On the whole, buyers endorse its brutal strength, saying that its hinge joint provides positive stops at both 45° and 0°, weighing 2.8 pounds and possessing a lifetime insurance.